For 2009 I have introduced several new classes. Of course they all use wire and many of them even melt the said wire with a torch. Over the past year my work has shifted a bit to include more low-tech meltalsmithing. 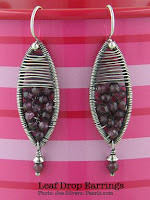 Fusing and melting wire has left me in a daze and I love to show it off any chance I get. Plus, hitting things with hammers feels good. Leaf Drop Earrings: These earrings are not only beautiful to behold but quick to make and the techniques can be used to create many different styles and components. At the top is a delicate woven wire cap designed to showcase the semi-precious stone beads below that are wrapped with fine wire to the inside of the frame. The marriage of fine silver metallurgy and wire weaving brings together the striking form of this ring. 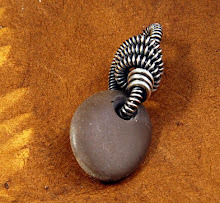 Students will learn how to draw a single bead made up of two wires with a torch, shape it into a ring form and apply woven wire embellishment. The variations of this technique are endless. Designed for students who have already been introduced to fusing with fine silver, this chain design is sure to leave those who gaze upon it lost in wonder. 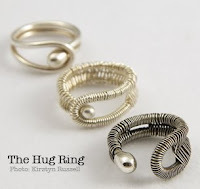 The inner rings seem to float freely over one another while the individual texture of each ring catches the eye. Students will cut their own jump rings, review the basics of fusing, fuse a multi-layered chain and add texture to the wire itself. how's the kitchen cleaning going? I don't think I have managed to completely clean my kitchen the way I like it since I started this dang blog. I am currently seeking an unpaid intern to handle those things for me, interested?